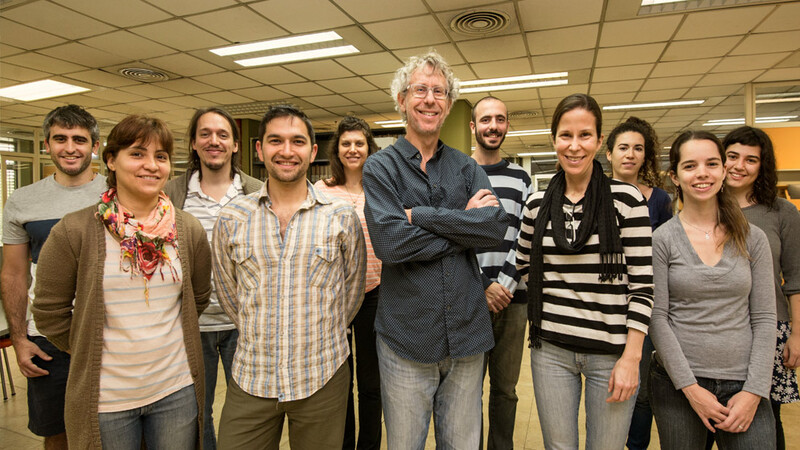 CONICET researchers at the Fundación Instituto Leloir identified the circuit that promotes the integration of neurons generated in the adult hippocampus during memory and learning processes, which become connected with neural networks in the brain. Schinder and his research team. Photo: CONICET Photography. Contrary to an old biology dogma, it is currently a well-known fact that the dentate gyrus of the hippocampus, a cortical region important for learning and remembering, generates neurons all life, a process called “adult neurogenesis.” It was later discovered that those new neurons were in charge of processing information of events linked to learning. Nevertheless, the mechanism responsible for “connecting” those new neurons to participate in learning processes, has been unknown so far. But now, a study published in Science and led by Alejandro Schinder, CONICET principal researcher at the Instituto de Investigaciones Bioquímicas de Buenos Aires (IIBBA, CONICET – Instituto Leloir) and head of the Neuronal Plasticity Laboratory, provides new knowledge on this subject. This study could be used to inspire new possible strategies to repair neural circuits affected by different pathologies of the nervous system such as Parkinson’s disease, Alzheimer’s disease, and injuries caused by trauma. The study was conducted by CONICET researcher Damiana Giacomini and Diego Álvarez, fellow, who are part of Schinder’s team. The scientists divided groups of mice in two completely different environments: one was a “boring cage” with wood chip upholstery, food and everything they needed to feel comfortable; and the other one was a kind of “mini amusement park” (so called enriched environment) where they had toys to explore and play, that is to say, different stimuli for curiosity. “So through advanced microscopy techniques, we observed that if we moved the mouse from the boring cage to the one that is full of stimuli for a short period of time (two days), new neurons born in the hippocampus undergoing their mid-stage development, grow quickly and connect to the preexisting neurons of that region of the brain. Contrary to that, in the case of the bored mouse, these neurons take longer to develop and connect, to the point that they might remain disconnected and then be eliminated”, Schinder, who is also an international investigator of the Howard Hughes Medical Institute in the USA, explains. The scientists have also noticed that the experience encouraged by the fun environment activated simultaneously GABAergic neurons which apparently promoted the integration of new neurons. In order to prove this, Schinder and his team conducted another experiment in which they simulated the encouraging environment by activating artificially (through synthetic proteins) the GABAergic neurons. The result was the same: “we obtained the same effect of the mini amusement park and the immature neurons connected quickly”, Schinder states. Then, the scientists performed the opposite experiment. 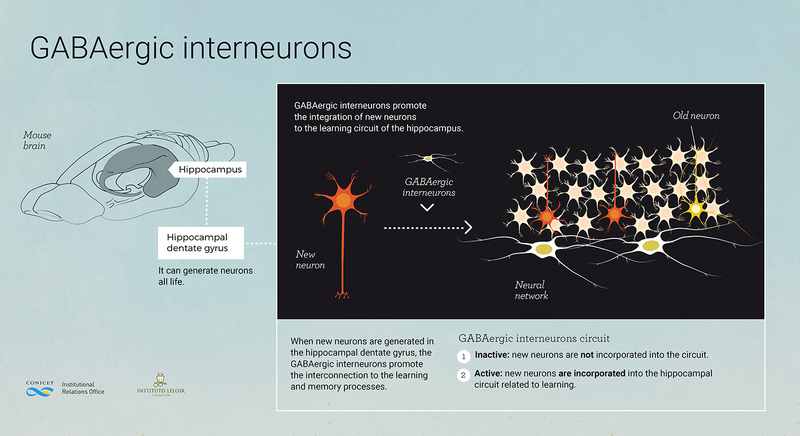 They put the animals in the amusement park, but “turned off” the GABAergic interneurons. They proved that those mice “behaved as if they were in the boring box, that is to say, without connecting the new neurons to the preexisting neural networks”, Giacomini describes. “This allowed us to confirm that this circuit is the one that turns the experience into signals that give the order to new immature neurons to facilitate their insertion into the network”, Álvarez explains. The biological mechanism described in mice at Schinder’s laboratory allows us to understand the processes that take place in the human brain. “In our next project, which will have the collaboration of a laboratory in Germany, we are going to study whether the stimuli described in this research can be used in the design of repair strategies in other parts of the brain. But there is still a long way to go in the field of basic sciences to try to achieve goals such as the repair of the damaged brain regions in a way that allows them to recover their original function”, Schinder affirms. “As there are mechanisms that capture neurons and incorporate them into the neural networks of the brain, one could visualize neurodegenerative diseases as a phenomenon in which neurons die and disconnect. There cases such as in Alzheimer’s disease, where the disconnection precedes neuronal death. In this context, it might be possible to think about strategies to help circuits to preserve neurons or, at least, to reduce the pace in which they disconnect. But we still need to conduct plenty of basic research to generate the necessary knowledge to make a leap forward and provide discoveries that can be used to develop medical therapies”, states Schinder, who received the Friedrich Wilhelm Bessel Award given by the Alexander von Humboldt Foundation in Germany in 2013 for his important contributions to neurosciences. Other researchers who are also authors of the study are: Sung Min Yang, Mariela Trinchero, Silvio Temprana, Karina Büttner and Natalia Beltramone, all members of the Schinder laboratory and CONICET.